SYNDICATED COLUMN: Mass Shootings Are The New Normal. Get Over It. Okay, that’s a very open-ended question with many potential answers. What I’d like to talk about this time is: why is it that Americans only begin to get serious about a problem after it’s too late to solve it? Currently, I’m thinking about the latest, depressingly predictable response to the Orlando massacre. As usual, right-wingers like Donald Trump want to restrict immigration. But even setting aside the obvious moral and practical economic objections to nativism, how would that prevent future mass shootings (in part) in the name of the Islamic State? Orlando shooter Omar Nateen wasn’t an immigrant. He was born in Queens, New York; his parents were from Afghanistan. If the Republicans’ goal is to get rid of potentially self radicalized Muslims, it’s too late. There are 3.3 million Muslims in the United States. Many are full-fledged citizens. Any group of people that numbers in the millions includes some who are mentally ill, some who are politically radical, some who are religious fundamentalists, and some who are some combination of all three. Since it’s illegal to deport U.S. citizens, millions of whom are Muslim, a few of whom are crazy – and the United States insists on pursuing an endless “war on terror” against Muslim countries – there’s no way that a policy of reduced immigration can prevent future attacks by homegrown Islamists. On what passes for a Left, Democrats like Hillary Clinton are pushing for tighter restrictions on guns. As usual. Indeed, it’s hard to argue that civilians require military grade weapons like the semi-automatic AR-15 assault rifle used to kill 49 people at the Pulse nightclub. Hunters don’t use them. If the AR-15 is legal, why not hand grenades? Had Nateen been forced to use a pistol or long gun instead, his bullets would have been smaller, the death toll lower. Some of his victims might have been able to overpower him as he tried to reload. Here again, however, it’s too late to fix the problem. The cat is out of the bag. Two years ago, the national sport shooting foundation estimated that there were between 5 million and 8.2 million assault-style rifles in American homes. Sales of these weapons always spike after mass shootings, so it’s a safe bet that that number has risen by at least 1 million or two since then. Even if Hillary Clinton were to succeed beyond her wildest dreams, assault weapons were banned permanently, what about those millions of AR-15’s already in circulation? Would she be willing to send jackbooted federal thugs door to door to search every home until every last one of them, or at least the lion’s share, were rounded up and melted down? Of course not. The truth is, this ship sailed back in 2004 when Congress allowed the federal ban on assault weapons to expire without being renewed. Congress’s failure to act over the last 12 years has transformed the United States into a nation awash in military hardware. 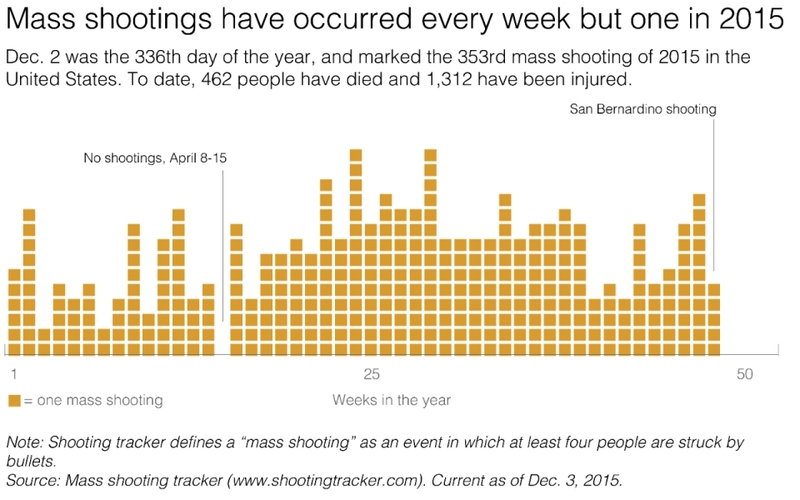 Mass shootings are the new normal. Get over it. “It’s too late to do anything about it, now let’s act” mania appears to have become as much of a part of our national character as the myth that everyone is a member of the middle class. Progressives and liberals who form the base of the Democratic Party, most of whom supported Bernie Sanders during the primaries, are engaged in a robust debate over whether to switch over to Hillary Clinton this fall, support a third-party candidate like Green Party presidential nominee Jill Stein, or stay home on election day. It’s the same old question: Do you vote for the lesser of two evils? Isn’t that voting for evil? Democrats for Clinton are trying to convince Bernie Sanders voters that November represents an existential threat, that if Donald Trump is elected everything we know and love about America will be destroyed. They don’t get it. What the Clintonites don’t understand is that it’s already too late. Yes, if Donald Trump gets in, there’s a strong danger that what’s left of American democracy will yield to something radically new and terrifying, full-fledged authoritarianism. But Hillary Clinton also represents something horrible: a continuation of the neoconservatism that led to the invasion of Iraq, has made the United States a target of Islamist terrorism, complete capitulation to the banking class whose power structure relies upon the vast majority of American workers toiling for longer hours and shrinking wages – in effect, the last nail in the coffin of the idea that ordinary people have the right to imagine themselves and their children living better than they have in the past. The existential battle isn’t in November. It was a couple of weeks ago, when Hillary Clinton appeared to nail down the Democratic presidential nomination. Whatever happens now, whether authoritarian Trumpism or steady-as-she-goes downwardly mobile Clintonism, we are screwed. Perhaps no issue better illustrates my point than climate change. I remember watching Jacques Cousteau on television in the 1970s, when he repeatedly warned that the oceans (along with the rest of the planet) were warming, and that it would soon – might already be – too late to stop it. The politicians and corporate executives, of course, ignored him and the other scientists who said the same thing. Now, finally, the political class is giving lip service to the crisis, though action remains in short supply. The fact is, Cousteau was probably right. It was probably too late to save the planet back then. It’s certainly too late now. The climate science is clear. The polar ice cap is never coming back; Antarctica is melting away. The process can’t be reversed. Even if every internal combustion engine in the world stopped running tomorrow morning, human beings have pumped too much energy into the closed system that is our atmosphere to reverse global warming. My intention isn’t to bum you out. All I’m saying is, let’s stop focusing on problems we can’t do anything about and work on those we still can. This entry was posted in Blog, Columns and tagged AR-15, Bernie Sanders, Climate Change, Denial, denialism, Donald Trump, Gun Control, Hillary Clinton, Orlando massacre, procrastination on June 20, 2016 by Ted Rall. Supporters of Obama go through the classic stages of grief after they realize that they’ve been cheated. This entry was posted in and tagged Acceptance, Anger, Bargaining, Change Poster, Computer, Denial, Golf, Golfing, homelessness, Obama, Plaintive Email, psychology, Revolution, Riot, Sellout Democrat, Shock, Stages, Television on November 28, 2011 by Ted Rall.